The recipe for magic . 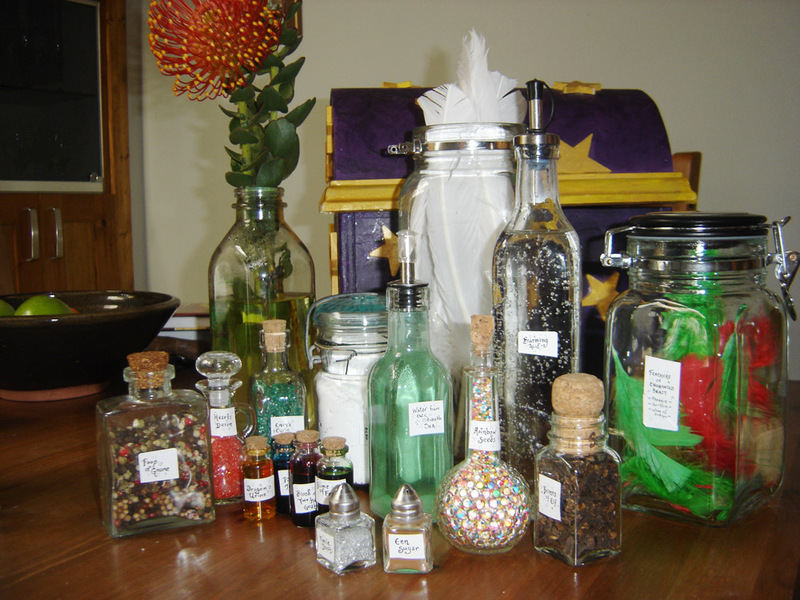 . .
I’m off to teach magic potions today in my creative writing class. It’s been some time since I’ve led this workshop, so I’ve been scampering about town trying to collect the various ingredients required. I can’t find newt eyes anywhere, so my students will have to do their concocting with the likes of dragon urine, pixie juice, gnome poop, elf bones, rainbow seeds, mummy dust, and burning acid. However, I did manage upon some heart’s desire and envy’s greed—two new ingredients for the kit. I had a happy adventure last week when I was on one of my quests for ingredients. I went to a antique shop on Main Street and here I found many a mysterious object. I got to talking with the proprietor and, with a twinkle in her eye, informed me that her “grandmam” had been a granny witch. Well, back in the old days (even before I was born) granny witches used to go around the towns helping out folk with their various ailments. They did some real work (for example, midwifery), but also wouldn’t hesitate to dabble in the more eldritch of activities—you know, spells and curses and the sort of thing. I wouldn’t exactly recommend any of my students to go licking a toad if they have a headache—but then again, I also tell them to never drink their potions, and they rarely take that advice! I gave the official Kendra Kandlestar web site a bit of a face lift this past week. I freshened up the graphics on the homepage and added some new entries to the Eencyclopedia (okay, I don’t actually call it that on the website, but it’s a fun word). Some of the additions include pages for Leemus Longbraids, Clovin Cloudfoot, Roompa Ringtail and Jamboreen. I also added an interactive map of the Land of Een. Do a little searching with your pointer and you will find that some of the locations on the map point to their own entries to give more information about a particular place. Eventually, I expand those listings (right now I have some illustrations to finish!). Just click here to view the map. I’ve always liked the idea of a house built inside a tree. Maybe it’s just the thought of bidding farewell to corners! Well, if you have spent anytime with Kendra over the course of her adventures, then you’ve had a glimpse or two of the old yew tree house where she lives with Uncle Griffinskitch. In Kendra Kandlestar and the Crack in Kazah, we’ll return to the yew tree house and even get a chance to sneak inside the secret library that our grumpy old wizard likes to sequester and study his books and other items of enchantment. I have completed a few new drawings for the yew tree house (inside and out), but this last week I turned my attention to another house built inside a tree. This house is for a new wizard character, and I thought I would make this one look even more strange and mysterious than Uncle Griffinskitch’s house. At first, I thought I would make the tree completely bare of foliage, but ultimately decided that I didn’t want the tree to look dead. So I ended up adding the leaves around the back of the tree. I do have the idea that the tree was dead when my wizard character moved in—perhaps it was the effect of magic-making that caused new life to sprout from the tree’s branches. I don’t have a plan to explain this in the book, but you never know—that particular story may make it into a future Chronicle. Kendra Kandlestar IV is complete! I reached a major milestone this week, finishing my version of the manuscript for Kendra Kandlestar and the Crack in Kazah, which I’ve now turned over to my publisher. Now they will work on it in earnest for the next few weeks to edit and improve my words. (Though I doubt they’ll find anything to improve—after all, I rarely make any mistrakes in my writing). In the meantime, I’m working on finishing up the illustrations. Here’s one of my latest, featuring Professor Bumblebean and Juniper Jinx. I’ve been wanting to do something new this term when it comes to inspiring my students about setting. Usually, we work on different types of maps—always a good activity, but I thought I’d encourage each student to pick one setting from his or her book and then construct it in diorama form. Of course, I never like to lead an activity until I’ve tried it myself. 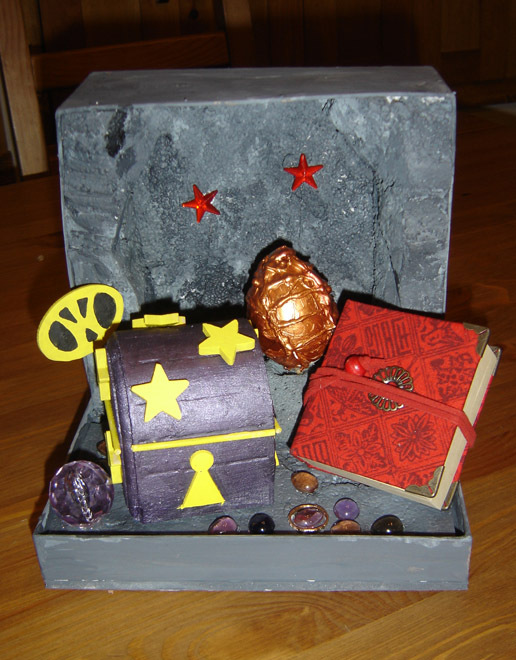 So I decided to build my own diorama from one of my Kendra Kandlestar books. At first I thought I might depict Oki in his confrontation with the coughing plant of Krodos, but in the end, I decided to construct the vault that lies beneath the Elder Stone. You can see the Box of Whispers in this scene (along with its key) and, perched next to it, is the infamous dragon egg that plays such an important part in the story. There’s a few other treasures to be found there too . . .
Oh, and special thanks to Charlotte for making the dragon egg! The manuscript for The Crack in Kazah is due to go to my publisher’s next week. That means a big EEK for me, but for YOU, that means a big hooray—because you’re that much closer to getting a chance to read it. I’ve been working fiercely on final edits to the manuscript before I turn it over, tweaking it here and there and, as Ratchet would say, working out the kinks. It’s kind of hard to show how a manuscript changes and make it interesting, but I can show you some of the revisions to my illustrations. I haven’t completed all of the pictures for this new book yet, but I have already gone back and redid some of them. I didn’t quite like the way it was looking too squished into the bottom half of the frame, so I moved the skarm upwards. I also realized that I needed to have Kendra holding her wand in this scene. Sometimes I can digitally edit my illustrations, but when there’s just too many changes, I might as well start from scratch. This next illustration is of a scene from later on in the book, when Kendra is sneaking through the Elder Stone. She comes upon a statue of the famous ancient Een, Leemus Longbraids. At first I wanted to make sure the focus of the illustration was on Kendra, so I intentionally left the walls blank, as shown below. Stay tuned for more sneak-peek illustrations soon!